There are several reasons for runny eyes in a rabbit, and it is important to seek the advice of a vet if the problem persists. Occasionally a number of babies in a litter may have runny eyes due to inherited eye lid deformities, where the tears spill over the eyelids instead of draining down the eye ducts to the nose (nasolacrimal ducts). As this may be hereditary, these rabbits should not be bred from. If the eye is irritated for any reason, too many tears may be produced and overflow down the cheeks. Shavings, hay or straw fragments in the eye, conjunctivitis or a corneal ulcer can cause this. 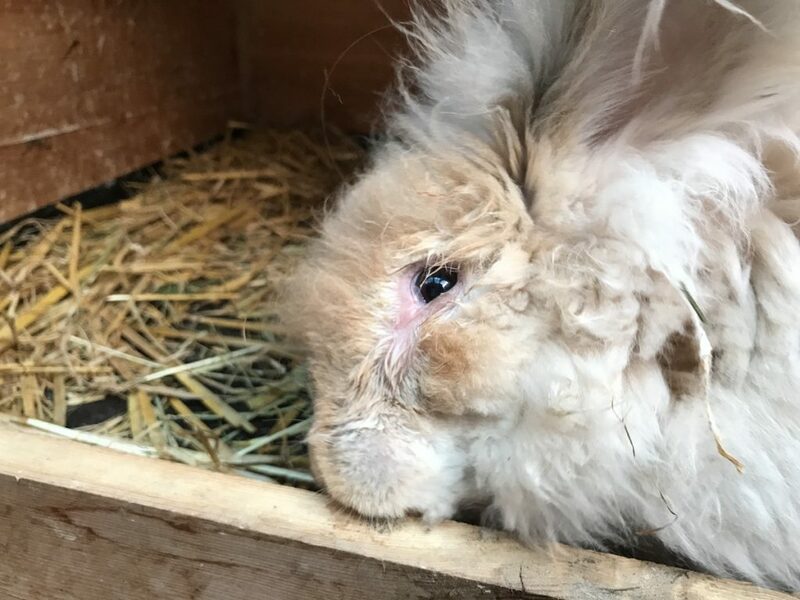 Angoras with heavily furred faces and wool around the eyes, causing irritation, can be prone to this problem, and many keep this type of Angora clipped short around the eyes. This problem may be seen in ageing rabbits, bucks more commonly than does, where roots of teeth block the ducts, and tears overflow down the rabbit’s face. This can often make the rabbit’s face red or sore. 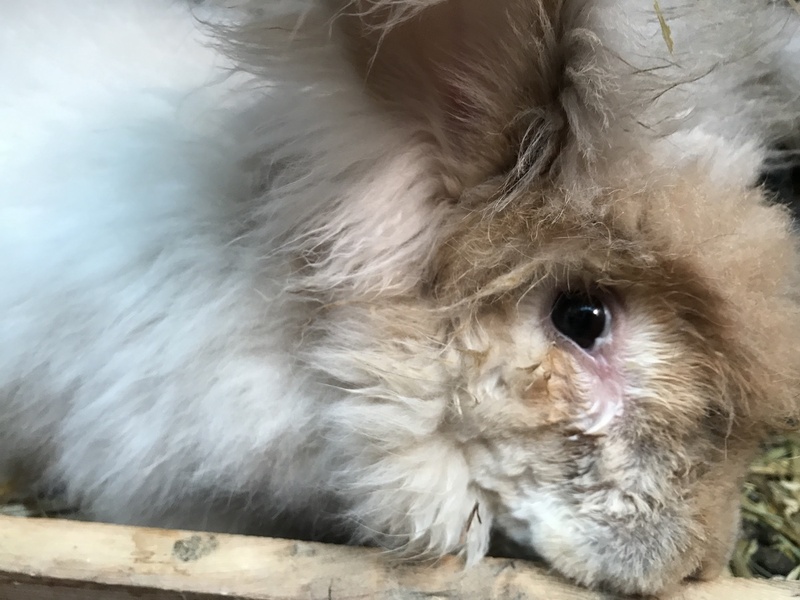 If the rabbit has moist fur around the eye, the eye may become secondarily infected, with white pus seen around the eye and welling up from the tear duct when the eye is examined. Check the eye for foreign objects. If there is white pus around the eye antibiotic drops will most likely be needed and an appointment should be made at the vet’s. If tears are clear, then clipping around the eye and waiting a day or two to see if it settles can be helpful. What might the vet do? The vet will examine the rabbit and check its teeth. He may stain the eye with dye to look for an eye ulcer. He may prescribe antibiotic drops. If the problem persists, he may recommend flushing the tear ducts under local or general anaesthetic, particularly if there is persistent infection. Many runny eyes will settle with time and clipping, or with a course of antibiotic drops. In elderly rabbits, where the problem is caused by the roots of the teeth blocking the ducts, the problem may persist. Keeping the fur cut short around the eye and using an eye cleaner such as Cleanocular eye cleaner around the eye keeps the rabbit comfortable and helps prevent secondary infection. A companion rabbit will help with grooming. If the skin around the eye is chapped, a little bit of Vaseline will protect the skin. The vet will advise on the long term management of each individual rabbit. Posted 15/01/2018 by LH & filed under Angora Welfare.